Home And we, the captive audience! And we, the captive audience! The countdown is on. Even as Tuesday marked the fourth anniversary of the election of Maithripala Sirisena as President of the nation, it also meant that now there is less than a year before the next presidential election- and the person elected at those polls should be in the office by this time next year. Major political parties and their respective leaders are fine-tuning their strategies towards this end and last week saw some of these tactics come to the fore. However, there were also indications that the main parties have yet to work out cohesive plans that would sustain them until the next election. A key move came from President Sirisena himself. The President had requested the resignations of provincial governors. The governors, who serve at the President’s pleasure, complied. At the time of writing, seven new governors have been appointed. Initially, Maithri Gunaratne (Central Province), Sarath Ekanayake (North Central Province), Peshala Jayaratne (North Western Province) and M.L.A.M. Hizbullah (Eastern Province) were sworn in as new Governors. A few days later, Dhamma Dissanayake (Sabaragamuwa Province), Keerthi Tennakoon (Uva Province) and Suren Ragawan (Northern Province) were sworn in. All of them are known as loyalists of President Sirisena. The first four have been in active politics. In fact, Hizbullah was a sitting Member of Parliament and resigned his seat to take up the new post. The appointment of new Governors has been seen as a move by the President to increase his grip on the political system, possibly with an eye of Provincial Council elections which are now overdue. Another move by President Sirisena to gain control of government came in the form of a decision to appoint a committee to consider qualifications and make recommendations for the appointment of chairpersons and boards of directors to state-owned enterprises. Some ministers of the United National Front (UNF) government have expressed their disagreement with this move as appointing heads of government institutions had, until now, been the prerogative of the subject minister. However, Prime Minister Ranil Wickremesinghe has acquiesced to this, stating that examining the qualifications of appointees would be beneficial to the institutions they head. Previously, the President had also nominated his own representatives to serve in the management of the major state media institutions, the Associated Newspapers of Ceylon Limited (Lake House), Rupavahini and the Independent Television Network (ITN), in addition to the nominees of the minister in charge, Minister Mangala Samaraweera. 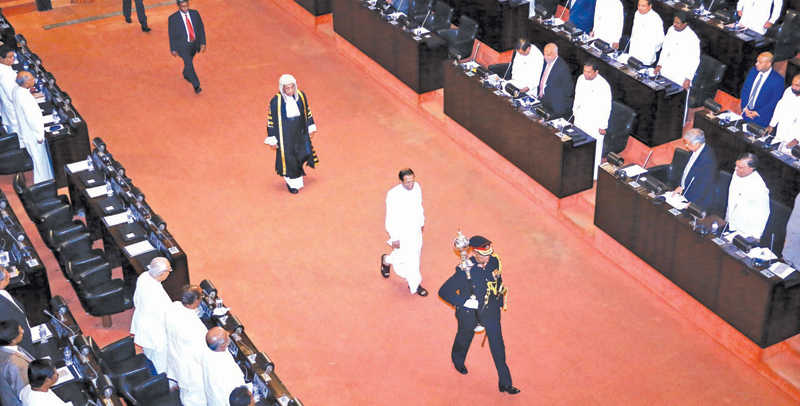 That President Sirisena has an eye on the next elections was also very evident when he addressed the United Peoples’ Freedom Alliance (UPFA) parliamentarians in Parliament this week. The President stated that the government should be compelled, both within and outside parliament, to hold an election this year. This would pave the way to establish a UPFA government in this year, he said. These sentiments come in the backdrop of some disquiet among the group of MPs loyal to the President. It is now no secret that some of them wish to join the UNF government. The President has resisted their requests and refused to swear them in as ministers if they do so. There is also a greater sense of frustration among electoral organisers of the Sri Lanka Freedom Party (SLFP) who were recently relieved of their responsibilities by President Sirisena. This was in preparation for an alliance with the Sri Lanka Podujana Peramuna (SLPP), informally led by former President Mahinda Rajapaksa. These organisers, who stood by President Sirisena at a time when he was at loggerheads with Rajapaksa, now fear that they will have to bow to the dictates of the SLPP which is negotiating with the SLFP from a position of strength, having resoundingly won the Local Government elections held in February last year. Although the President moved to strip SLFP organisers of their posts, he also handpicked Dayasiri Jayasekera to the position of Secretary General of the SLFP. He replaces Professor Rohana Lakshman Piyadasa who is an academic and not an active politician. Jayasekera has had a chequered career. Initially a secretary to G. L. Peiris who now nominally heads the SLPP, Jayasekera began his political career in the SLFP but rose to fame mostly in the United National Party (UNP), from which he first entered Parliament and was seen as a rising star in the party who even ran for the post of its National Organiser against Daya Gamage but lost that contest. He returned to the SLFP in 2013 under Mahinda Rajapaksa in a much-publicised defection, resigning from Parliament to successfully run for Chief Minister of the North Western Province. Jayasekera backed Rajapaksa against President Sirisena at the 2015 Presidential election and returned to Parliament at the August general elections that year. Since then he has been a loyalist of the President. Jayasekera appears to have created an initial impact when he publicly declared that President Sirisena would be the SLFP’s candidate at the next presidential polls if the President wishes to run again. This was after Rajapaksa had declared that the SLFP and the SLFP would field a single candidate at the next presidential election. “We will reveal who the candidate is at the right time. Now we are trying to form a broad alliance. We will all get together and field one candidate instead of two. As SLFP Chairman, President Maithripala Sirisena is strengthening the SLFP. This will not be an obstacle to form an alliance,” Rajapaksa had said when he visited the SLPP’s office at Battaramulla. Rajapaksa was later questioned about Jayasekara’s statement, but he laughed it off dismissively but these conflicting positions, as well as the dissension among SLFP MPs and electoral organisers, suggest that even if there is rapprochement between the leaders of the SLFP and the SLPP, many more issues need to be ironed about before an alliance between the two parties could be worked out. It is also relevant to note that it is now certain that presidential elections will precede a general election. This would mean that the SLPP and the SLFP- and indeed, the UNP- should finalise their presidential candidates and focus on this election. Once a clear winner emerges at the presidential poll, his or her party has usually won the general election that followed. In the UNP meanwhile, party leader and Prime Minister Ranil Wickremesinghe has been canvassing for a broader alliance, the ‘Democratic National Front’ for the next major elections. Some in the party have expressed reservations about this concept, pointing out that the UNP as a party has not fielded a presidential candidate for 14 years since Wickremesinghe lost narrowly to Rajapaksa in 2005. The UNP, however, has remained silent on the issue of who their presidential candidate would be. At present, it is also pushing the 20th Amendment to the Constitution sponsored by the Janatha Vimukthi Peramuna (JVP) which proposes the abolition of the Executive Presidency. Realistically though, this amendment has little chance of success, as the government lacks a two-thirds majority in Parliament. This being an election year - or, at the very least, a year spent in preparation for elections - the political climate will remain fluid and dynamic. Sri Lankans may have only just recovered from suspense-filled political drama late last year that saw some farcical moments but they should brace themselves for more of the same as 2019 unfolds.